The journey of life takes us to many places. Along the route we take quite a few twists and turns, passing situations, encounters, and people that shape our perceptions of the world and ourselves. A lot of people are also of the opinion that our personalities are shaped by our birth dates – which, in turn, plays a huge part in our likes and dislikes, such as our preferences when it comes to décor and design. Whether you believe in star signs or not, it is quite interesting to note the different Zodiac signs’ meanings, compatibilities, character traits and much more that make each one unique. 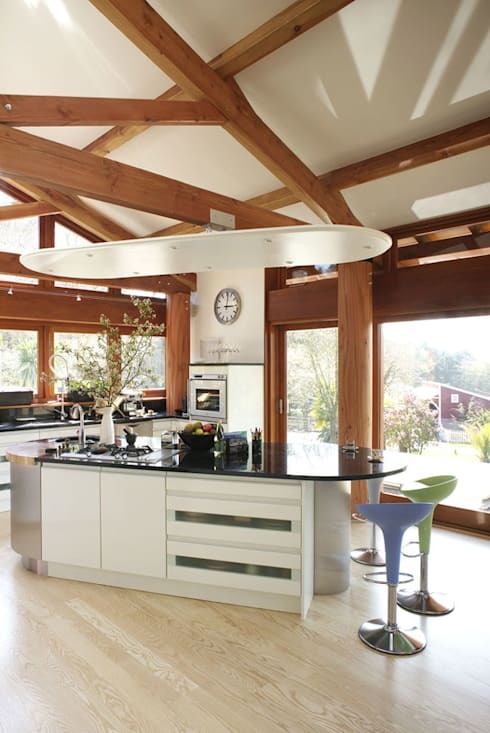 Based on these notions, we have selected 12 kitchen layouts to match the traits, likes and dislikes of the 12 star signs. Scroll down for your relevant sign, or read them all. And whether you want to consider our article a guideline or merely a fun take on kitchen designs, enjoy determining if your chosen kitchen fits in with your particular personality! The Crab of the Zodiac creatures places high value on family life, and therefore prefers the more sober tones when it comes to decoration. They normally opt to include plants in their spaces, and details mean a great deal to them. 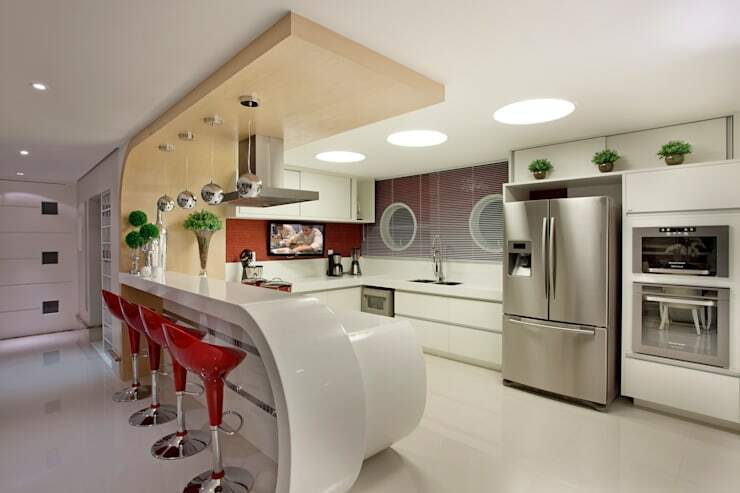 In this kitchen by Brazilian Romero Duarte & Architects, we have an overall white kitchen with smooth finishes and design, which is sure to please the convenience required by the Cancer. 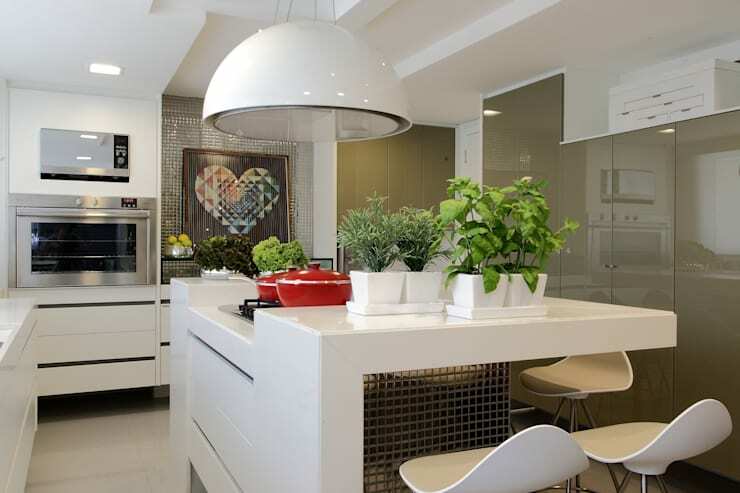 Plants and intricate details add striking touches to this light and airy culinary space. The Ram is on a quest for functionality and organisation to facilitate his path throughout life. And just as this star sign values a set system, so does this kitchen. High-level appliances neatly separated in their own individual spaces and compartments enhance efficiency. A high ceiling will accommodate those bright ideas that go hand in hand with planning every meal. That generous skylight introduces a stream of natural lighting to improve those functioning brainwaves. 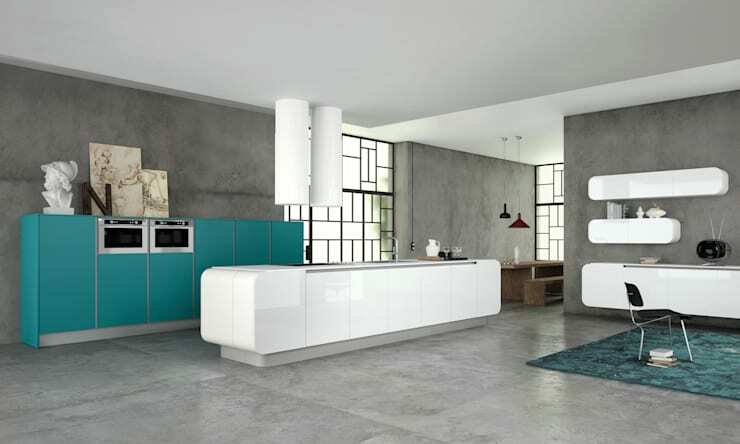 And a clear, crisp colour tone allows for no distractions; after all, the kitchen is a place of work! The Bull seeks to merge a good amount of comfort with a classic style. In view of this, the decor and vintage overtones in our accompanying image seems to be an excellent choice for people born under this star sign. A floor pattern echoing the 70s ensures a throwback to better days gone by. The furniture also seems to be inspired by this era, yet cannot be considered “old” or “over”, but rather “sleek and modern”. And what cosy kitchen would be complete without a bare brick wall to enhance that homely, family vibe? When it comes to mixing styles, the Twins are in on it. Always seeking creativity, the Gemini prizes dynamic solutions in visually rich environments. 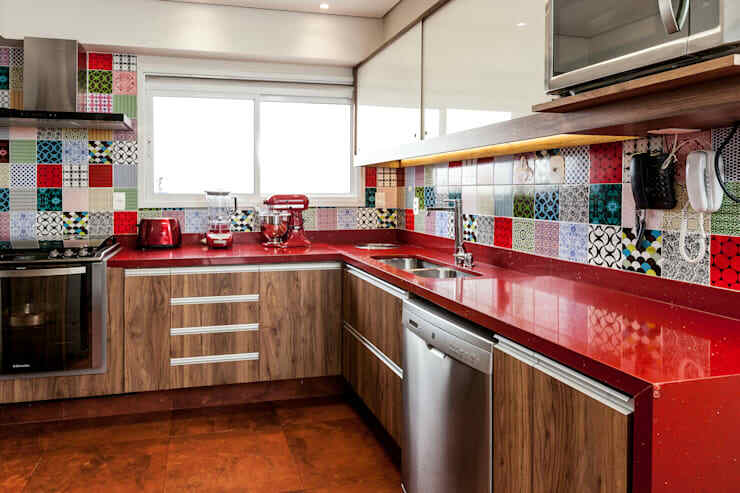 To accommodate this requirement, we opted for a good batch of colourful tiles for a vivid and rich culinary experience. 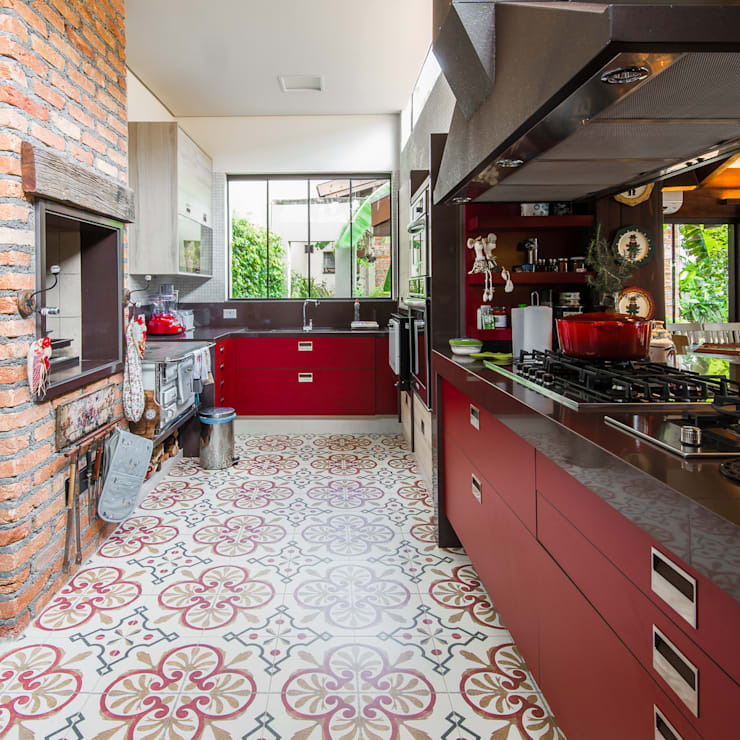 Add to that a fiery red tone that flows magnificently throughout the counters (remember how brightly coloured those 70s and 80s interiors were?). To contrast the retro element, classic kitchen cabinets were added, sporting a striking combination of sleek steel and warm wood. The Lion loves his/her luxurious spaces, so sophistication was the keyword with which we searched for the perfect kitchen. In our accompanying image, luxury seems to exude from each and every corner: the white bar and kitchen island stylishly curves on the one side to offset the rigid lines in the rest of the kitchen. Modern bar stools gleam luxuriously against the white backdrop of the light palette. Lighting is presented by sleek and silver spheres dangling from above, contrasting most effectively with the lush green tones created by the potted foliage. This kitchen uses geometric shapes to create rhythm in the decor, superbly catering for the young, energetic and entertaining character of the Leo. When it comes to taking charge of effective organisation, the Virgin of the Zodiac can be relied upon. And to aid him/her in establishing successful order, we chose a kitchen island with several niches and cupboards. No more disorder or clutter from now on! A blackboard space against the wall is the perfect element to make notes and keep on top of important reminders. 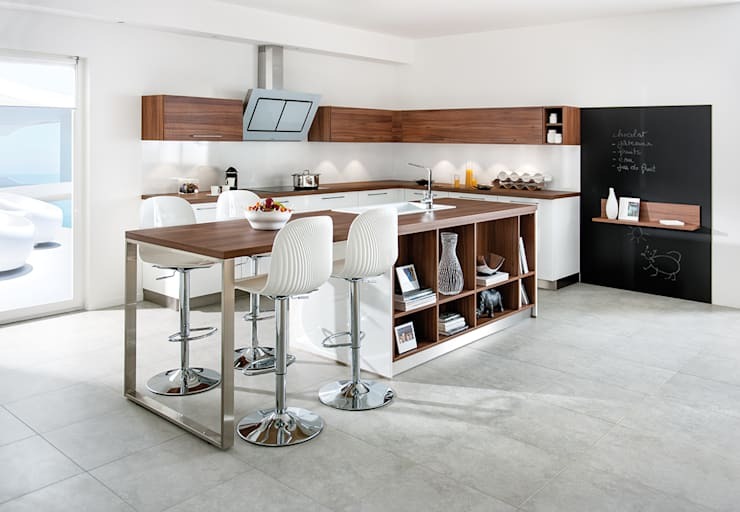 Add to that a clean (almost minimalistic) environment that boasts a chic combination of stylish wood and white marble, and we can’t believe that anybody (Virgo or otherwise) will have trouble loving this kitchen. A healthy balance between refined decor and elegant details – that’s what the Scales value. With that in mind, we searched long and hard to find a kitchen space for the Libra, and we are sure that our choice is a winning one. A timeless look with a classic balance between black and white. Simple and straightforward, yet very modern and clean. An elegant lamp suspended above the middle of the table (balance, remember?) completes the graceful touches to the kitchen. And who could overlook that unique texture of the wood? Rough and grainy, contrasting brilliantly with the sleek and gleaming areas that dominate the rest of this chic, culinary space. The symbol of the Zodiac Scorpion is used for those people known for their strong personalities. And when it comes to choosing décor, practicality is king. On the mission to enhanced personality and functionality, no one can withstand the appeal of this minimalist kitchen. The rounded edges of the cabinets, together with the ‘less is more’ approach, place this kitchen firmly in the minimalist realm (with a slight nod to the avant-garde style). We present sufficient surfaces for preparation and adequate appliances to dish up anything from a single piece of toast to a five-course meal. But even the most realistic person can appreciate a striking palette, which is why all of this is in a refreshing combination of whites, greys and sea green. 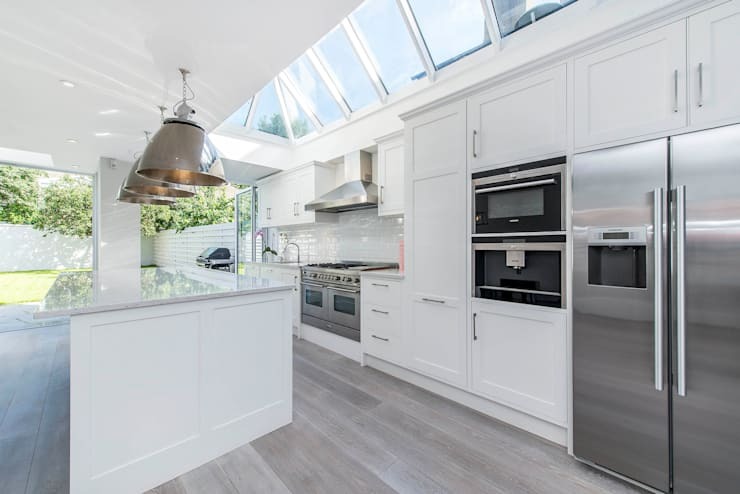 The Archer represents people with a fun disposition; those who appreciate environment where they can socialise with friends and family – hence, the importance of the kitchen, which is known as the heart of any house. 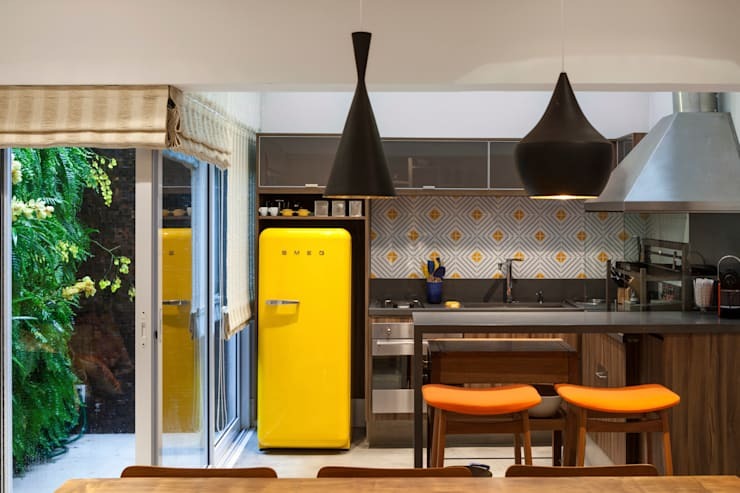 To echo these joyful characteristics, yellow was chosen for the fridge, as yellow is the brightest colour in existence. It is also the colour of optimism and creativity. This tone is beautifully echoed in the wall tiles and orange stools, perfectly brightening up this jovial space. The combination of different materials plays on the sociable character of the Sagittarius, who will no doubt thrive in this expressive space. Like its symbol, people born under the sign of the Goat prefer spaciousness. It is with this notion in mind that we selected this kitchen. Its high ceilings and generous natural light streaming in from outside present a more than adequate space to roam free. Furthermore, the light colours enhance the visual spaciousness of the room, making it seem bigger and wider than it really is. And just look at those generous windows, setting up a strong visual link with the outdoors to keep the Capricorn cook company while preparing culinary works of art. In addition, the centralisation of the main elements (stove, island, etc.) facilitates the circulation and increases the functionality of the space. A strong love for modern design – that is the Water Bearer of the Zodiac spectrum. Straightforward, linear designs, visual space… these are all characteristics of the modern style. To that effect, we picked out a kitchen that has a spacious floor, a multitude of storage areas, and a sleek, shiny touch. The stainless steel elements reinforce the modern trend, and shines even brighter when combined with the warm wood and dusty magenta wall. A distinctive trait of the modern style is no excessive décor or embellishments, which was perfectly copied in our example. For people born under the sign of the Fishes, creativity is important, as long as it goes hand in hand with a strong dose of functionality. The size of the environment is of little concern to them, as long as it meets their requirements and personal taste. We think our chosen kitchen is a perfect match for the typical Pisces person. 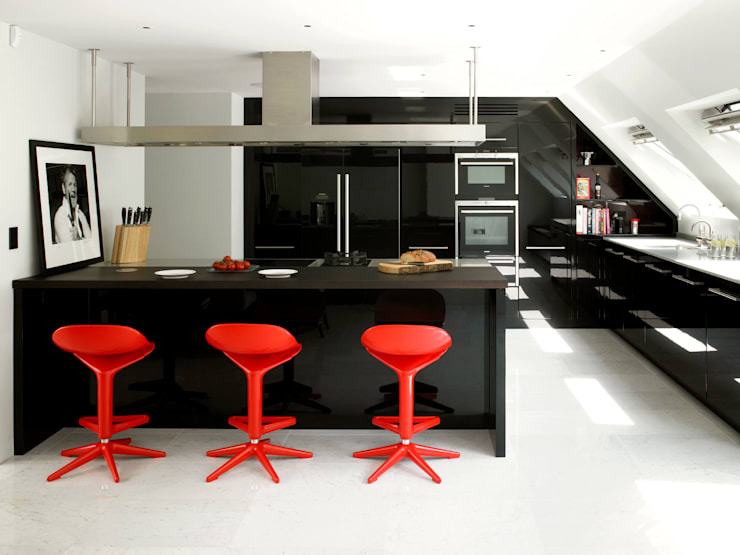 The crimson red stools gleam devilishly against the black backdrop that is the cabinets. Both of these colours offset stunningly against the crisp whiteness of the floors, walls and ceiling. 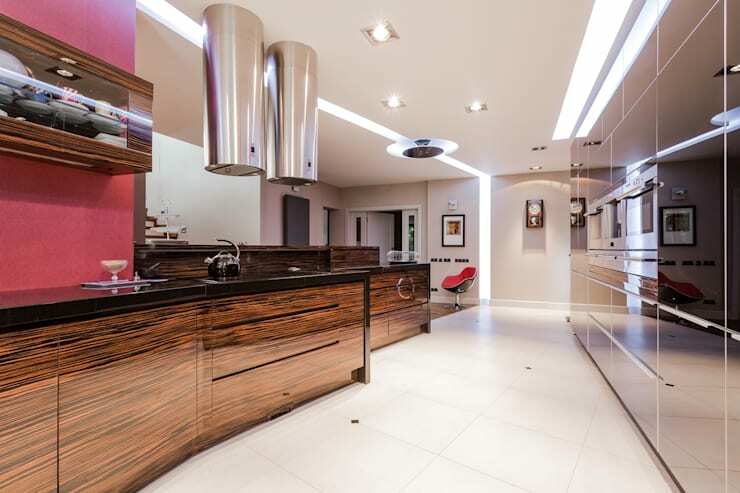 Ample space, together with a strong sense of originality, enhances this kitchen excellently, and presents a unique area where we can function effortlessly while getting creative with those recipes. From star signs to favourite colours, take a look at: How Colours Influence Your Bedroom.